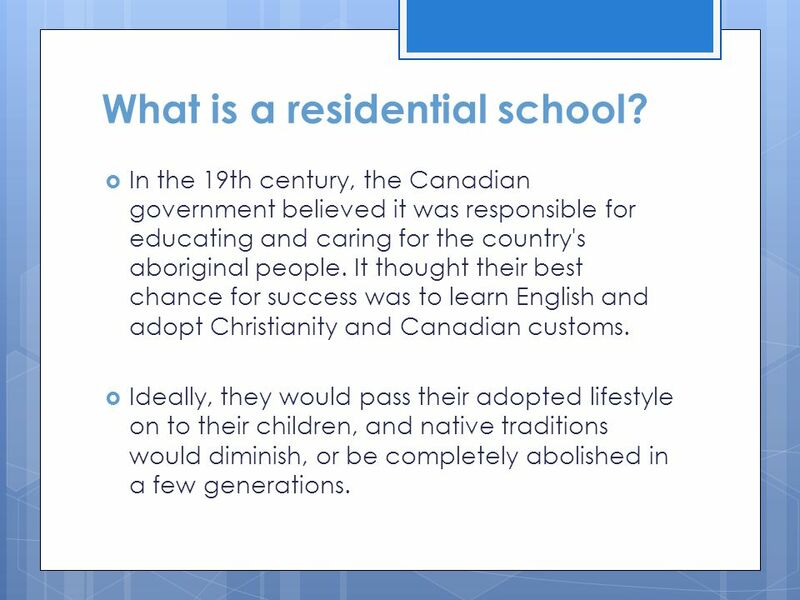 2 What is a residential school? In the 19th century, the Canadian government believed it was responsible for educating and caring for the country's aboriginal people. It thought their best chance for success was to learn English and adopt Christianity and Canadian customs. Ideally, they would pass their adopted lifestyle on to their children, and native traditions would diminish, or be completely abolished in a few generations. 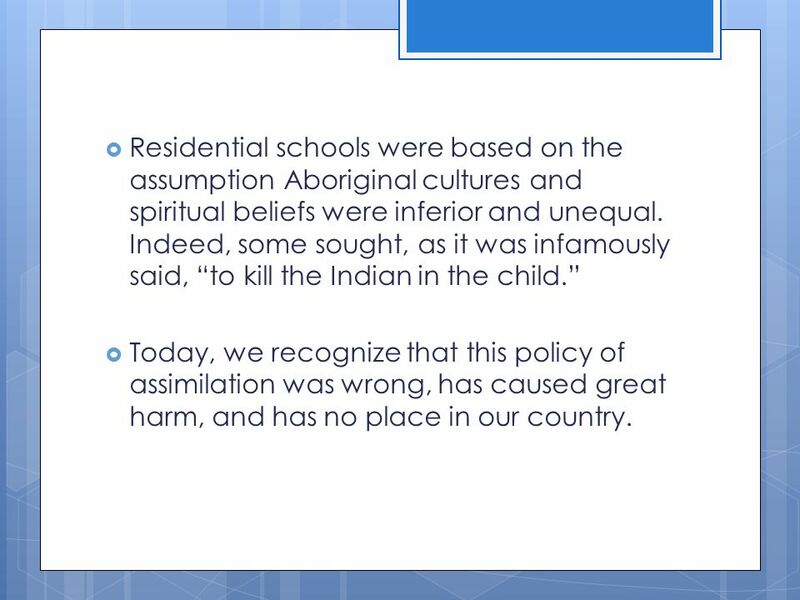 3 Residential schools were based on the assumption Aboriginal cultures and spiritual beliefs were inferior and unequal. Indeed, some sought, as it was infamously said, “to kill the Indian in the child.” Today, we recognize that this policy of assimilation was wrong, has caused great harm, and has no place in our country. 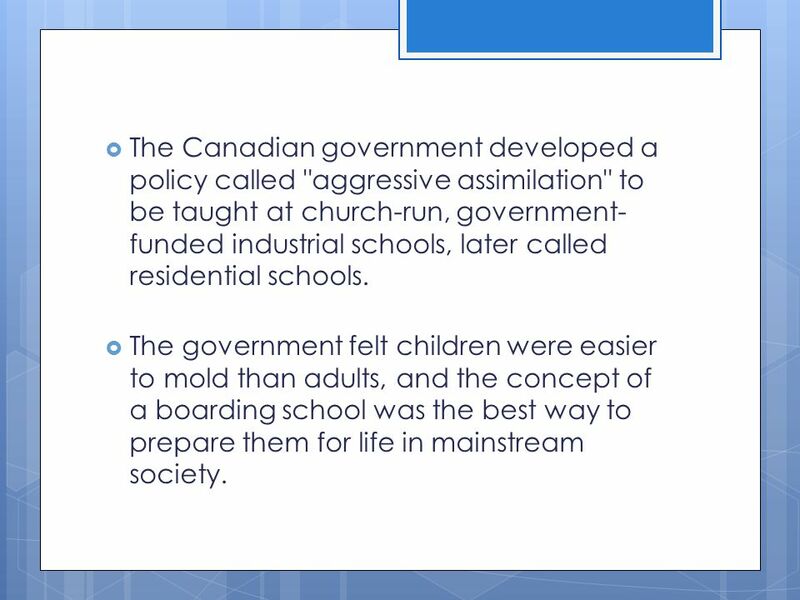 4 The Canadian government developed a policy called "aggressive assimilation" to be taught at church-run, government-funded industrial schools, later called residential schools. 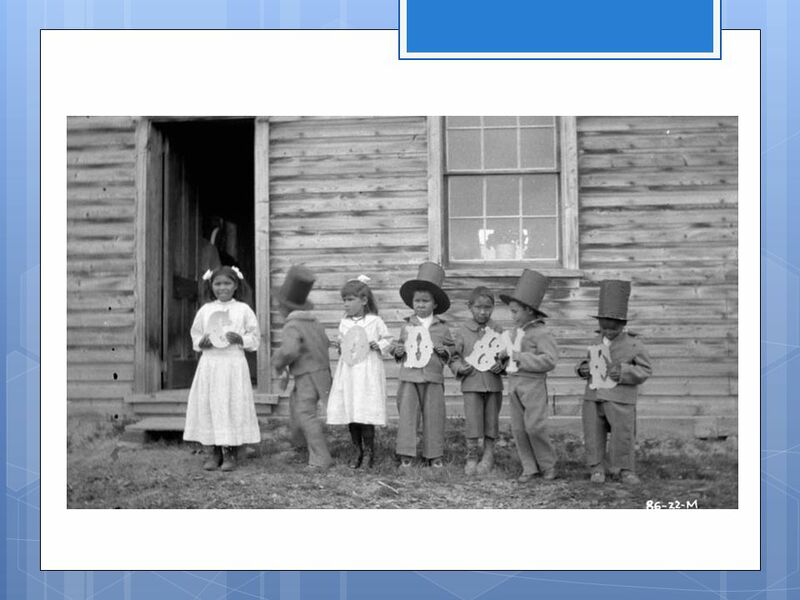 The government felt children were easier to mold than adults, and the concept of a boarding school was the best way to prepare them for life in mainstream society. 5 Residential schools were federally run, under the Department of Indian Affairs. Attendance was mandatory. At the time, agents were employed by the government to ensure all native children attended. 6 How many residential schools and students were there? Initially, about 1,000 students attended 69 schools across the country. 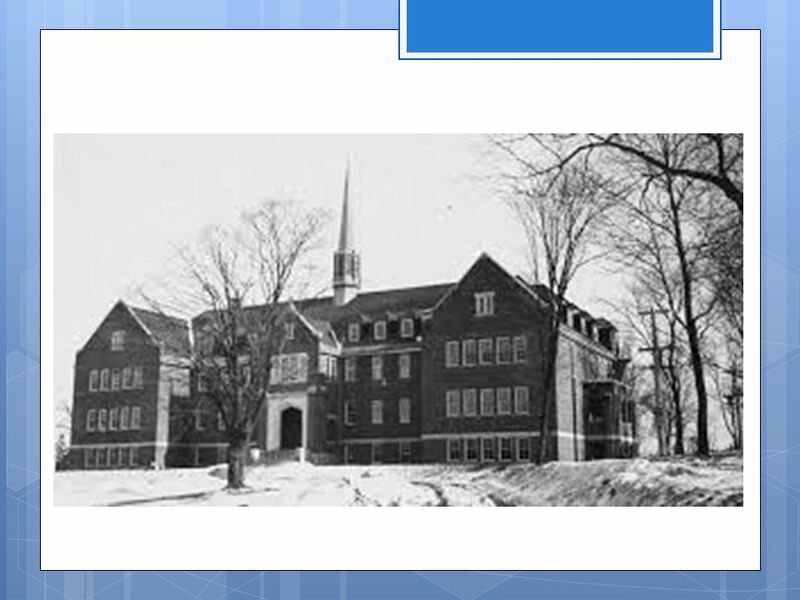 There were a total of about 130 schools in every territory and province except Newfoundland, Prince Edward Island and New Brunswick from the 19th century to the last, which closed in 1996. In all, about 150,000 aboriginal, Inuit and Métis children were removed from their communities and forced to attend the schools. 7 What went wrong? Residential schools were established with the assumption that aboriginal culture was unable to adapt to modern society. It was believed that native children could be successful if they blended into mainstream Canadian society by adopting Christianity and speaking English or French. Students were discouraged from speaking their language or practicing native traditions. If they were caught, they would experience severe punishment. 8 Former students of residential schools have spoken of horrendous abuse at the hands of residential school staff: physical, sexual, emotional, and psychological. 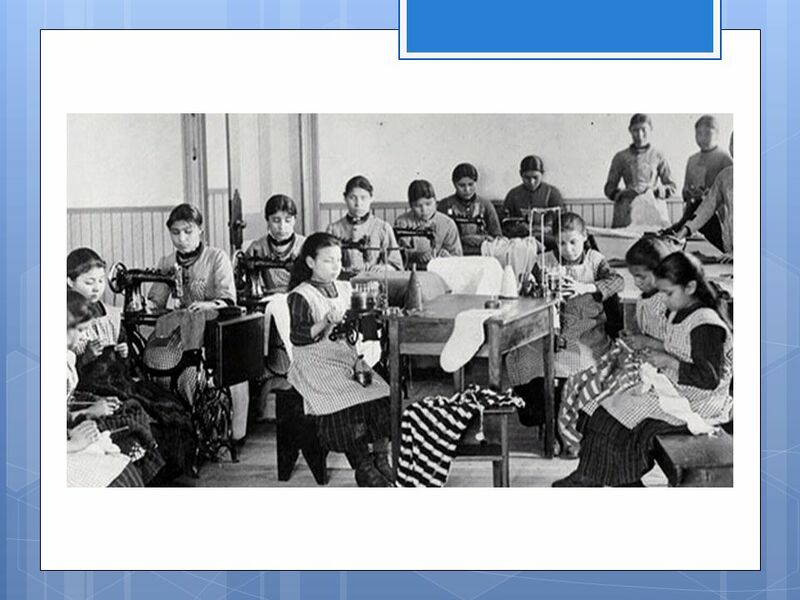 Residential schools provided Aboriginal students with an inferior education, often only up to grade five, that focused on training students for manual labor in agriculture, light industry such as woodworking, and domestic work such as laundry work and sewing. 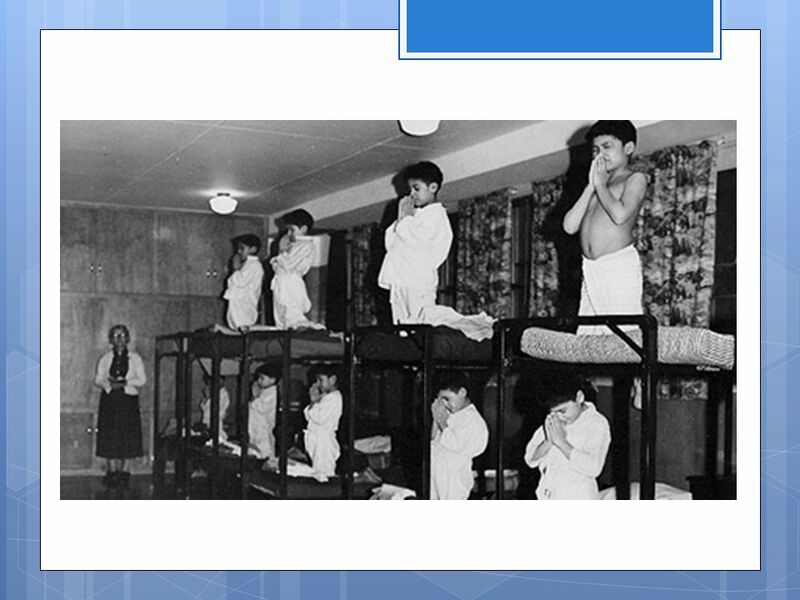 9 Students at residential schools rarely had examples of normal family life. They were in school 10 months a year, away from their parents. All letters from the children was written in English, which many parents couldn't read. Brothers and sisters at the same school rarely saw each other, as all activities were separated by gender. 10 When students returned to the reserve, they often found they didn't belong. They didn't have the skills to help their parents, and became ashamed of their native heritage. The skills taught at the schools were generally not very helpful; many found it hard to function in an urban setting. There was great devastation for those who were subjected to years of mistreatment. 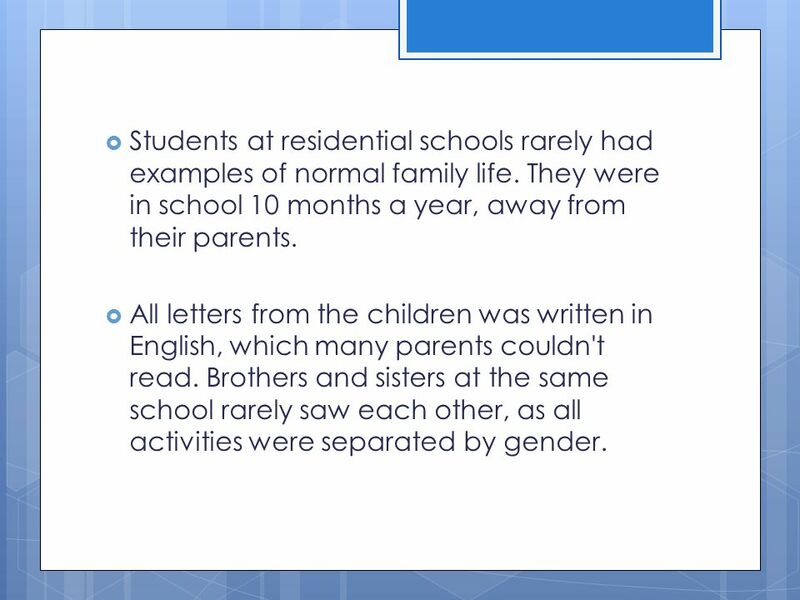 11 Because they were removed from their families, many students grew up without experiencing a nurturing family life and without the knowledge and skills to raise their own families. The devastating effects of the residential schools continue to have significant impact on Aboriginal communities. Because the government’s and the churches’ intent was to eliminate all aspects of Aboriginal culture in these young people the residential school system is commonly considered a form of cultural genocide. Students had their hair cut short, they were dressed in uniforms, and their days were strictly regimented by timetables. Boys and girls were kept separate, and even siblings rarely interacted, further weakening family ties. Chief Bobby Joseph of the Indian Residential School Survivors Society recalls that he had no idea how to interact with girls and never even got to know his own sister. 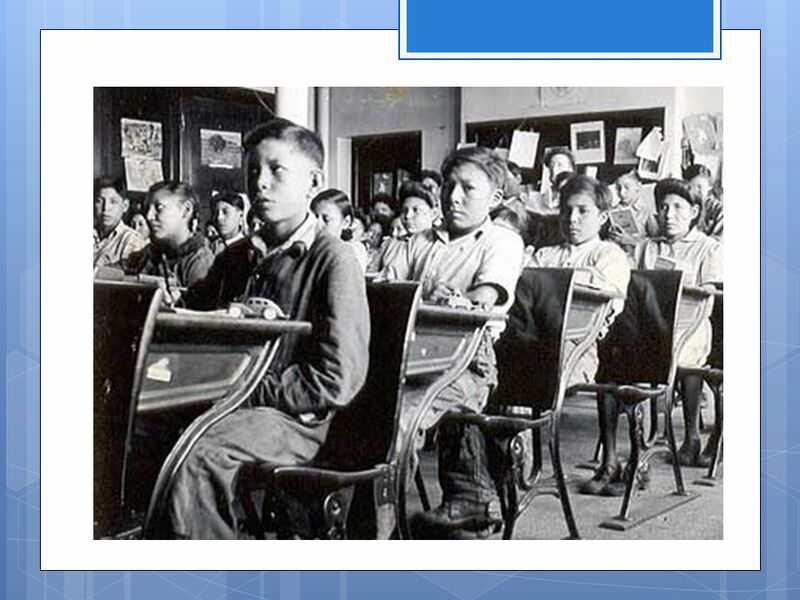 13 Residential school students did not receive the same education as the general population in the public school system, and the schools were underfunded. Teachings focused primarily on practical skills. Girls were primed for domestic service and taught to do laundry, sew, cook, and clean. Boys were taught carpentry and farming. 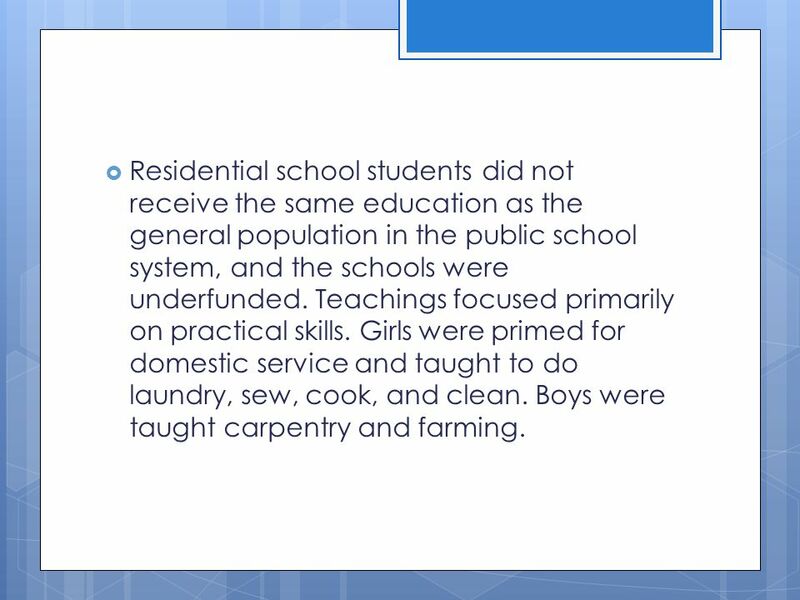 14 Many students attended class part-time and worked for the school the rest of the time: girls did the housekeeping; boys, general maintenance and agriculture. This work was unpaid and was presented as practical training for the students. With so little time spent in class, most students had only reached grade five by the time they were 18. At this point, students were sent away. Many were discouraged from pursuing further education. 15 Abuse at the schools was widespread: emotional and psychological abuse was constant, physical abuse was used as punishment, and sexual abuse was also common. Survivors recall being beaten and strapped; some students were shackled to their beds; some had needles shoved in their tongues for speaking their native languages. These abuses, along with overcrowding, poor sanitation, and inadequate food and health care, resulted in a shockingly high death toll. In 1907, government medical inspector P.H. Bryce reported that 24 percent of previously healthy Aboriginal children across Canada were dying in residential schools.5 This figure does not include children who died at home, where they were frequently sent when critically ill. Bryce reported that anywhere from 47 percent (on the Peigan Reserve in Alberta) to 75 percent (from File Hills Boarding School in Saskatchewan) of students discharged from residential schools died shortly after returning home. 17 The extent to which Department of Indian Affairs and church officials knew of these abuses has been debated. 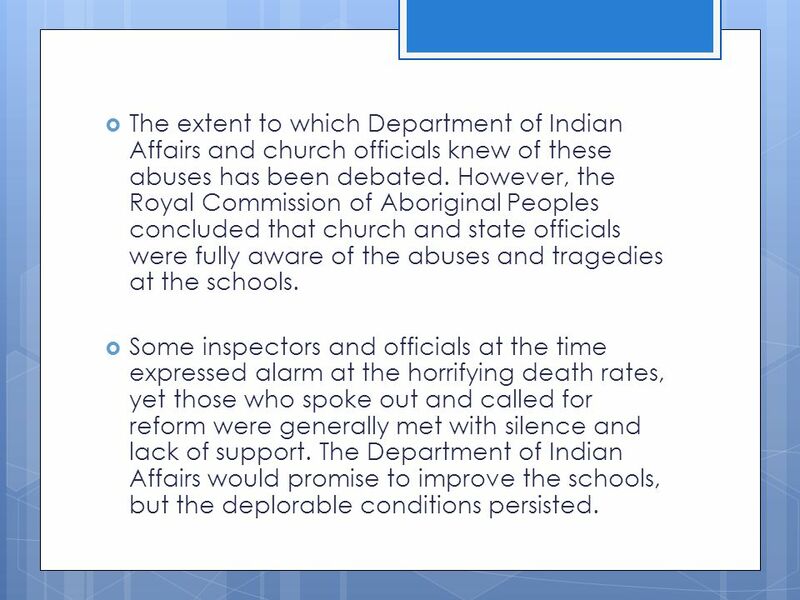 However, the Royal Commission of Aboriginal Peoples concluded that church and state officials were fully aware of the abuses and tragedies at the schools. Some inspectors and officials at the time expressed alarm at the horrifying death rates, yet those who spoke out and called for reform were generally met with silence and lack of support. The Department of Indian Affairs would promise to improve the schools, but the deplorable conditions persisted. 18 Some former students have fond memories of their time at residential schools, and certainly some of the priests and nuns who ran the schools treated the students as best they could given the circumstances. Even so, these “good” experiences occurred within a system aimed at destroying Aboriginal cultures and assimilating Aboriginal students. Song by Elmer Crane This song was written by residential school survivor Elmer Crane. After listening to this song please answer the following questions: 1. What is the message of this song? 2. Were any of the images shown in this video particularly moving to you? “Power and Politics” This clip comes from the program “Power and Politics” and outlines abuse that occurred at St. Anne’s Indian Residential Schools in the 40s and 50s. After watching, please answer the following question: This clip explains how many students were used as test subjects for vaccinations – without their parent’s knowledge and consent. What does this suggest about the way those running the schools felt about Aboriginal students? By the 1950s, it was clear that assimilation was not working. Aboriginal cultures survived, despite all the efforts to destroy them. The devastating effects of the residential schools were becoming more widely recognized. The government also acknowledged that removing children from their families was very bad to the health of the individuals and the communities involved. In 1951the half-day work/school system was abandoned. 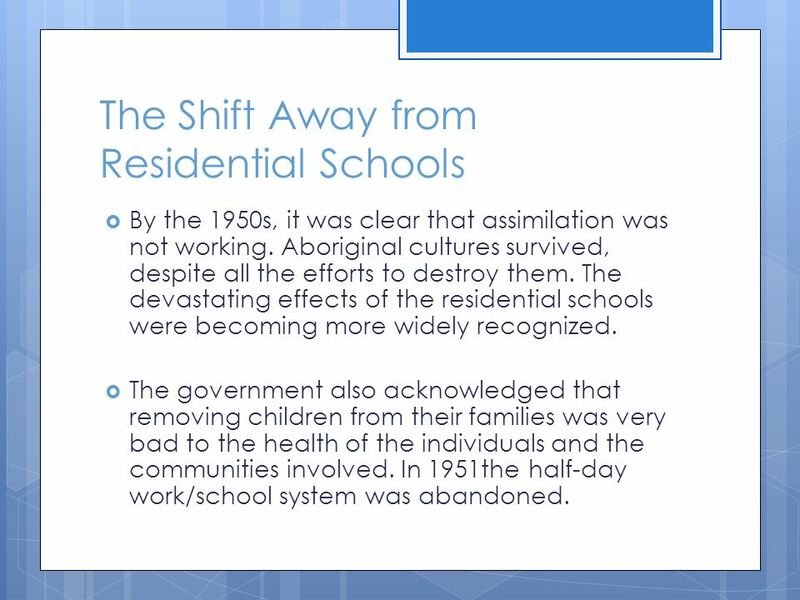 28 The government decided to allow Aboriginal children to live with their families whenever possible, and the schools began hiring more qualified staff. In 1969, the Department of Indian Affairs took exclusive control of the system, marking an end to church involvement. Yet the schools remained underfunded and abuse continued. Many teachers were still very much unqualified; in fact, some had not graduated high school themselves. 29 In the meantime, the government decided to phase out segregation and begin incorporating Aboriginal students into public schools. Although these changes saw students reaching higher levels of education, problems persisted. Many Aboriginal students struggled in their adjustment to public school where they faced discrimination by their non-Aboriginal peers. Post-secondary education was still considered out of reach for Aboriginal students, and those students who wanted to attend university were frequently discouraged from doing so. The process to phase out the residential school system was slow. In the 1960s, the system’s closure gave way to the “Sixties Scoop,” during which thousands of Aboriginal children were “apprehended” by social services and removed from their families. The “Scoop” lasted for roughly two decades but child apprehensions from Aboriginal families continue to occur. The last residential school did not close its doors until 1986. 31 Long Term Impacts Generations of children have grown up without a nurturing family life. As adults, many of them lack adequate parenting skills and, having only experienced abuse, in turn abuse their children and family members. The high incidence of domestic violence among Aboriginal families results in many broken homes, perpetuating the cycle of abuse and dysfunction over generations. 32 Many observers have argued that the residential school system contributed to extremely low self-esteem in Aboriginal communities. This has manifested itself in self-abuse, resulting in high rates of alcoholism, substance abuse, and suicide. 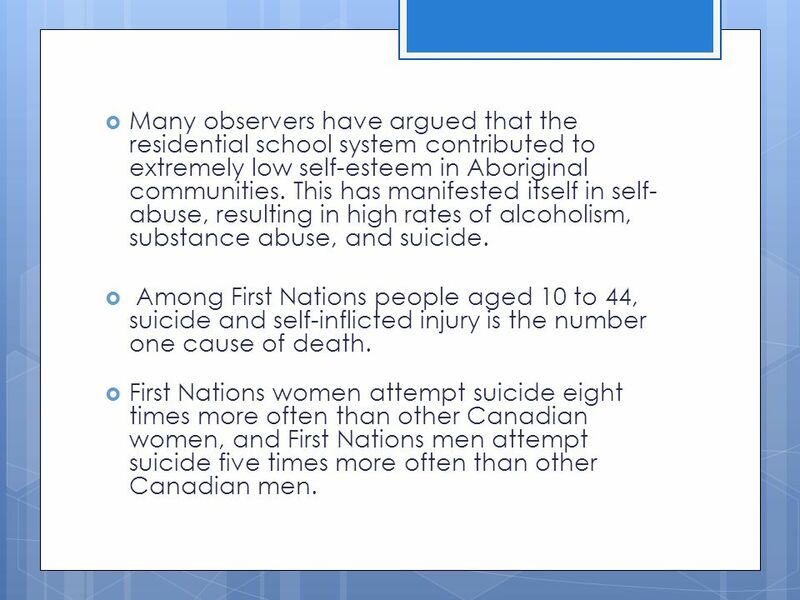 Among First Nations people aged 10 to 44, suicide and self-inflicted injury is the number one cause of death. First Nations women attempt suicide eight times more often than other Canadian women, and First Nations men attempt suicide five times more often than other Canadian men. 33 Many Aboriginal children have grown up feeling that they do not belong in “either world”: they are neither truly Aboriginal nor part of the dominant society. They struggle to fit in but face discrimination from both societies, which makes it difficult to obtain education and skills. The result is poverty for many Aboriginal people. 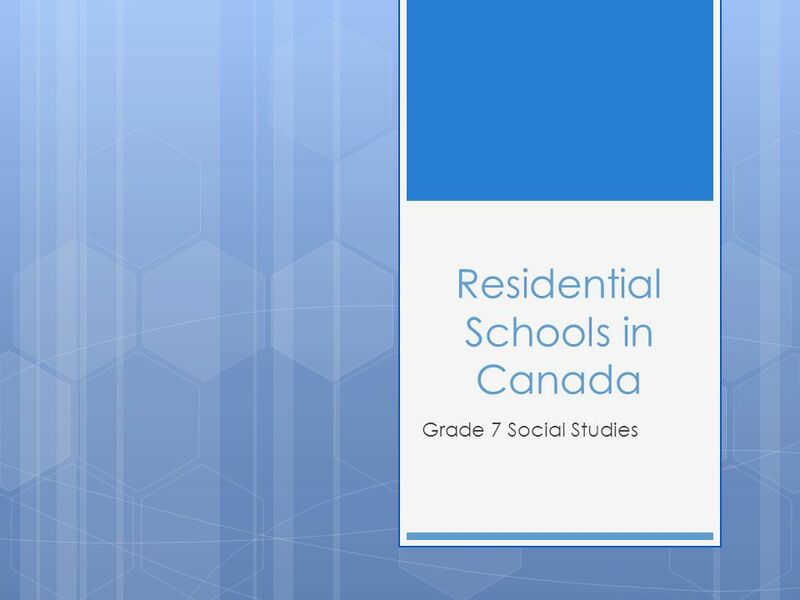 In addition, the residential schools and other negative experiences with state-sponsored education have fostered mistrust of education in general, making it difficult for Aboriginal communities and individuals to break the cycle of poverty. 34 What will former students receive for compensation? Compensation called Common Experience Payments was made available to residential schools students as of May 30, Students were eligible for $10,000 for the first year or part of a year they attended school, plus $3,000 for each additional year. As of 2010, $1.55 billion had been paid, representing 75,800 cases. This compensation plan releases the government and churches from all liability relating to residential schools, except in cases of sexual abuse and serious incidents of physical abuse. 36 What will happen in those cases of sexual or physical abuse? An Independent Assessment Process, or IAP, was set up to address sexual abuse cases and serious incidents of physical abuse. A former student who accepts the Common Experience Payment can pursue a further claim for sexual or serious physical abuse. 37 Is there more being done to compensate the victims? The government is funding Commemoration initiative, which consists of events, projects and memorials. A total of $20 million will be available over five years. The Aboriginal Healing Foundation was given an additional $125 million. Churches involved in the residential schools will contribute up to $100 million in cash and services toward healing initiatives. Prime Minister Stephen Harper delivered an official apology to residential school students in Parliament in 2008. 38 Who else has apologized for the abuse? Though the Catholic church oversaw three-quarters of Canadian residential schools, it was the last church to have one of its leaders officially address and apologize for the abuse. In 2009, Pope Benedict XVI expressed his "sorrow" to Canada's Assembly of First Nations for the abuse and "deplorable" treatment that aboriginal students suffered at Roman Catholic Church-run residential schools. 39 Assembly of First Nations Leader Phil Fontaine said the Pope’s statement wasn't an "official apology" but added that he hoped the statement will "close the book" on the issue of apologies for residential school survivors. Other churches implicated in the abuse apologized in the 1990s. Archbishop Michael Peers clearly offered an apology on behalf of the Anglican Church of Canada in 1993, stating "I am sorry, more than I can say, that we were part of a system which took you and your children from home and family." The Presbyterian Church signed a statement of apology in "It is with deep humility and in great sorrow that we come before God and our aboriginal brothers and sisters with our confession," it said. The United Church of Canada formally apologized in 1986 and in 1998 for the abuse that happened at residential schools. "To those individuals who were physically, sexually, and mentally abused as students of the Indian Residential Schools in which the United Church of Canada was involved, I offer you our most sincere apology," the statement by the church's General Council Executive said. 41 Discussion Questions Why were the residential schools created? Who ran the residential schools? What were some of the problems that occurred at the schools? Why did students not usually get to see their siblings? What happened when students returned to the reserves? 42 Questions continued… Why couldn’t parents and their children communicate while they were in school? How are victims of the residential schools being compensated? What other types of compensation is being given to the native community? Who has apologized for the abuse and poor conditions that aboriginal students endured? 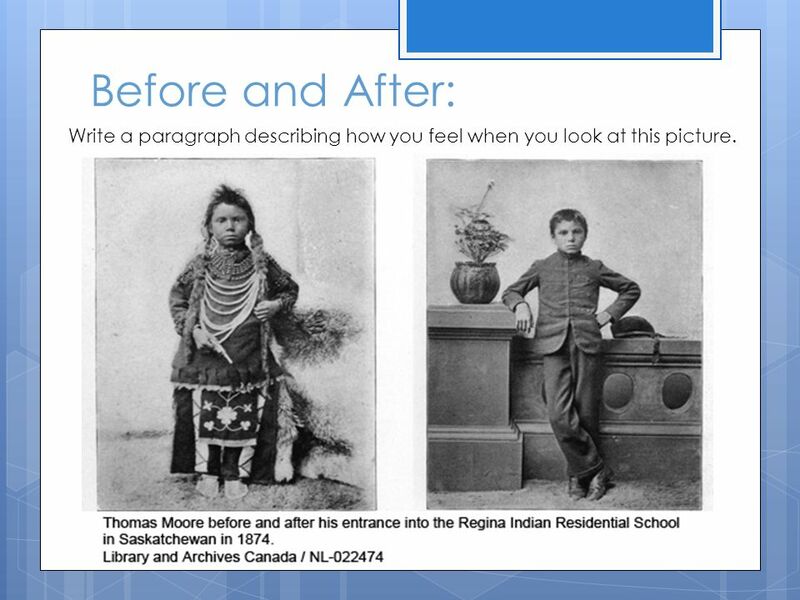 How has residential schools impacted generations of Aboriginals? 43 Before and After: Write a paragraph describing how you feel when you look at this picture. 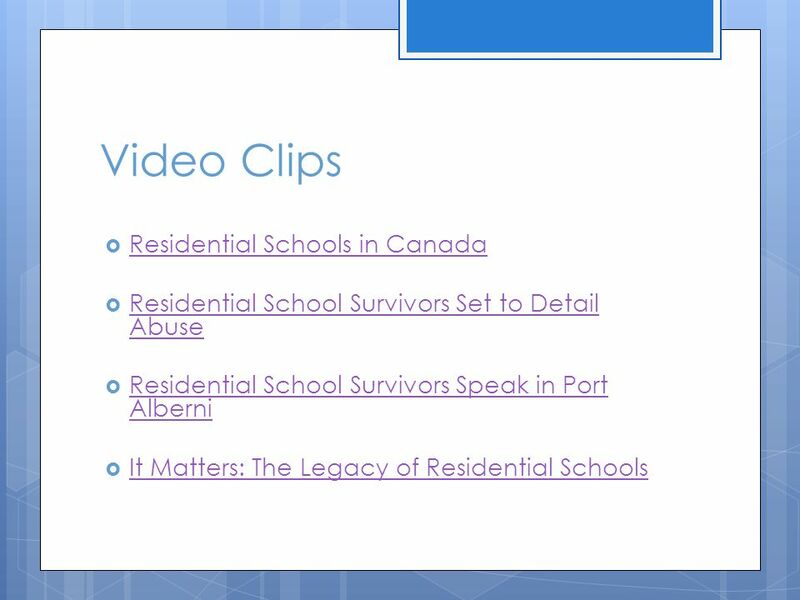 Download ppt "Residential Schools in Canada"
Using the Courts to Address Historical Wrongs John McKiggan: Arnold Pizzo McKiggan. Residential Schools. Questions - lets discuss 1. What were residential schools? 2. What do you think was the nature and purpose of residential schools? The Stolen Generation. Took The Children Away Archie Roach (Mushroom Records 1990) This story's right, this story's true I would not tell lies to you.  As we have learned in this chapter, Aboriginal peoples have been in North America since the earliest of times. Before the European’s arrival in North. Residential schools hold a dark legacy Purpose was to educate and civilize the First Nation to adopt a more Western lifestyle Gradual Civilization. 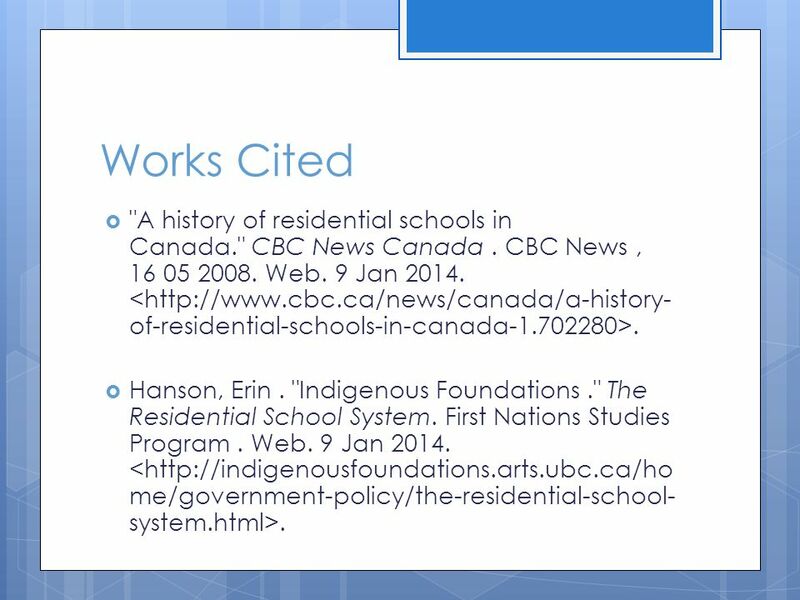 Origins of Residential Schools. Autonomy Lost Before the 1820s, the British position in North America was precarious Threat from the French until 1763. Impacts of the Residential School System. o In 2010, Canada ranked 8 th on the Human Development Index (HDI) out of 169 countries. When aboriginal communities. Meaghan Sheehan Gettysburg College Anth 223 – Indigenous Peoples, the Environment, and the Global Economy The Inuit are an indigenous group inhabiting. 14 land treaties were signed on Vancouver Island before Confederation between the First Nations and James Douglas 1899 – the 1 st and only land treaty. Immigration in Canada from 1946-on. Impact of Returning Soldiers & War Brides 1.War Brides – coming to different country, culture, living conditions 2.Some. Chapter 9 - Historical Origins and Contemporary Issues Unit 2 – Social 10-1. Purpose  To assimilate Native children into a Christian lifestyle and European work habits  In 1920 it was made into law that all Native children were. 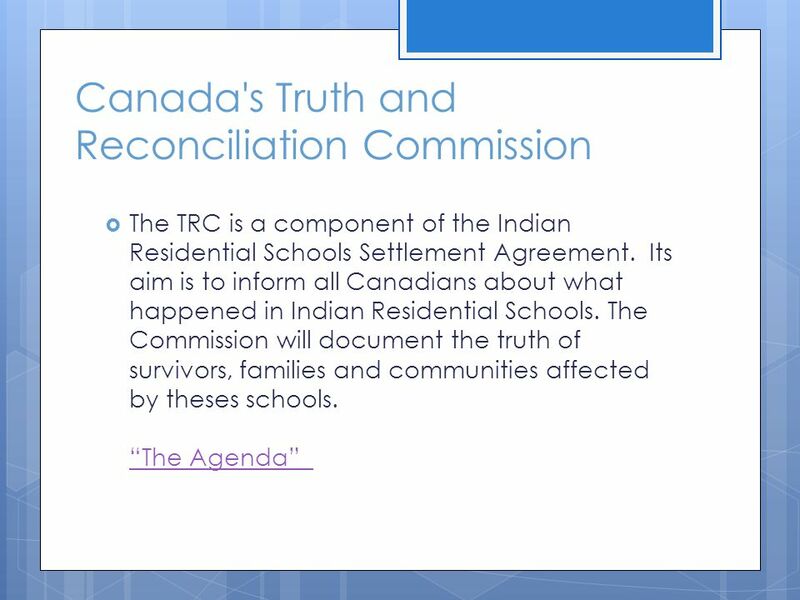 Indian Residential Schools The Report Presented by Gail Smith. RESIDENTIAL SCHOOL LEGACY A Shameful Event In Canadian History. Chapter 4 Focus Question: To what extent has Canada affirmed collective rights?